Australia has committed to cut ghg emissions by 26-28% from 2005 levels by 2030. According to Climate Action Tracker: “this target is equivalent to a range of around 5% below to 5% above 1990 levels of GHG emissions excluding LULUCF in the year 2030.” The commitment was made in August 2015. In April 2015 the government published a key issues paper entitled “Setting Australia’s post-2020 target for greenhouse gas emissions.” The paper came under sustained criticism for its reluctance to acknowledge the target of keeping global warming below 2C. Fortunately this target was acknowledged in Australia’s INDC submission. This brought the governments position back into line with the two Garnaut Reviews on Climate Change which recognised the importance of keeping ghg emissions to 450 ppm of CO2. Australian governments have frequently used the language of justice and equity when explaining national ghg targets. However, as indicated in my original report, these arguments have always focused on national concerns. This language is repeated in Australia’s INDC contribution statement. Moreover, the document accentuates what the government considers “ambitious”, “reasonable” and “fair”. Tellingly, these verbs are only supported with reference to Australia’s previous 2020 targets (an internal comparison) and not with broader principles of equity and justice. Thus, while the government claims that their contribution is “squarely in the middle of comparable economies” independent analysis has argued that they are actually towards “the bottom of the pack of comparable countries, on key indicators.” The latter view is also supported by independent analysis from groups like Climate Action Tracker which have labelled Australia’s contribution ‘inadequate’. 6. Express grave concern that the continued increase in the production of fossil fuels, particularly the construction of new coal mines, undermines efforts to reduce global GHG emissions and the goal of decarbonising the global economy. g. a new global dialogue on the implementation of an international moratorium on the development and expansion of fossil fuel extracting industries, particularly the construction of new coal mines, as an urgent step towards decarbonising the global economy. The former Prime Minster Tony Abbott made explicit ethical arguments in favour of coal production, noting: “”Coal is good for humanity, coal is good for prosperity, coal is an essential part of our economic future, here in Australia, and right around the world.” The current Prime Minister, Malcolm Turnbull has distanced himself from these remarks but he also rejected calls for a moratorium on new coal mines, saying that if Australia stopped its coal exports it would not change global emissions “one iota.” Turnbull further justified his stance with reference to the 2015 International Energy Agency’s World Energy Report which says that coal will be a primary part of the energy mix, and will also have to power substantial back-up capacity for alternative energy. On the 18th of November 2015 the Turnbull government agreed to cut funding dirty coal-fired electricity by billions of dollars. The agreement, backed by 34 wealthy countries, is expected to give a boost to the United Nations climate. Leaked documents seen by Fairfax Media showed Australia had opposed a US-Japan deal and watered down the agreement to large “supercritical” coal plants. 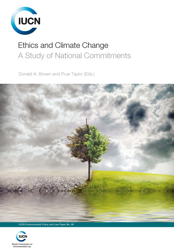 Australian NGO’s frequently employ the language of ethics and justice in discussions concerning Australia’s responsibility for climate change. However, to the best of my knowledge, no Australian NGO has analysed our INDC from this perspective. The Climate Change Authority (independent agency established by the Climate Change Authority Act 2011) criticised Australia’s INDC and advocated for a scientifically informed, globally equitable emissions target for Australia of between 40-60% below a 2000 baseline by 2030. As suggested, the Authority sought to based this figure on pure science and did not expressly describe any ethical concepts that informed their analysis. • The extent to which the INDC was consistent with popular opinion and climate change and the urgency in mitigating warming. Australia has similar participatory mechanisms as other western democracies. The traditional green and white paper mechanisms, exposure drafts of legislation, focus groups and surveys are familiar ways of gathering citizens’ views about particular initiatives. On legislative or policy matters affecting citizens at large, plebiscites may also be used. Sometimes, where policies have a particular impact on certain categories of citizens, governments go to considerable lengths to consult with the affected target groups and those who defend their interests. Nevertheless, it remains generally the case that governments define the issues for consultation, set the questions and manage the process. A number of Australian cities have shown significant leadership on tackling climate change. For example, the Austrian Capital Territory (ACT) government has a legislated target to reduce its emissions by 40% by 2020 and source 90% of its electricity from renewable sources by 2020. The City of Sydney has achieved carbon neutrality in its operations and has a 100% by 2030 local electricity generation target. Other major cities, including Perth, Melbourne and Adelaide all aim to achieve zero net emissions by 2020. This work has been championed by a number of city Lord Mayors who have advocated climate action. For example, Clover Moore, the Lord Mayor of Sydney attended the Copenhagen Climate talks in 2009, supported the introduction of carbon pricing in Australia and has championed the City of Sydney’s plan to reduce greenhouse emissions, “Sustainable Sydney 2030”. Commenting on the need for climate action Clover Moore writes: “With a warming of two degrees — and projections show we are headed for a four to six degree change — we risk catastrophic climate change…Sydney is moving towards a more sustainable future, climate change demands we do more.” Moreover, in September South Australia launched a new strategy to decarbonise its economy and has set a goal for Adelaide to become the first carbon neutral city in the world. 12. For developed nations, identify the most recent national commitment, if any, the nation has made on funding adaptation or losses and damages in vulnerable countries? Australia will contribute A$200m to the UN Green Climate Fund. The former Labor government was an early donor, tipping in $500,000 in 2012 to help get the fund going, as well as almost $600m on a precursor “fast-start” fund. Australia and South Africa have also been elected as co-chairs to the fund. The case has been made that Australia should have pledged more and the contribution to the fund were taken directly from the foreign aid budget. In other words, no new money was allocated to help developing countries that are currently suffering the effects of climate change. Since the government seems to be making clear that there will be no major change to Australia’s climate policy until 2017 we cannot expect funding to increase anytime soon. 13. For developed nations, did your nation acknowledge any ethical or justice based responsibility for making a commitment on funding adaptation or losses and damages in vulnerable countries? 14. Have NGOs or the media in your nations identified or discussed the potential obligations of high-emitting nations to fund adaptation or losses and damages in poor vulnerable nations? Australian NGO’s are far less constrained than government to talk about the obligations of high emitters, climate debt and climate justice. These views will also be reported in state and national news papers. To take just one example, in October 2014 the Australian Youth Climate Coalition hosted the Pacific Climate Warriors. While in Australia, over 200 participants hopped in kayaks to block outgoing coal ships in Horseshoe Bay beach, Newcastle. 1 Australia’s Intended Nationally Determined Contribution to a new Climate Change Agreement www4.unfccc.int/submissions/INDC/Published%20Documents/Australia/1/Australias%20Intended%20Nationally%20Determined%20Contribution%20to%20a%20new%20Climate%20Change%20Agreement%20-%20August%202015.pdf. 3 Setting Australia’s post-2020 target for greenhouse gas emissions https://www.dpmc.gov.au/pmc/publication/setting-australias-post-2020-target-greenhouse-gas-emissions-issues-paper. 5 Garnaut Climate Change Review http://www.garnautreview.org.au. 6 ABC News, ‘Government says its new climate change target is good for jobs, environment’ http://www.abc.net.au/news/2015-08-11/government-says-its-new-climate-change-target-is/6689898. 9 Suva Declaration on Climate Change, https://d3n8a8pro7vhmx.cloudfront.net/theausinstitute/pages/231/attachments/original/1441668038/PACIFIC_ISLAND_DEVELOPMENT_FORUM_SUVA_DECLARATION_ON_CLIMATE_CHANGE.v2.pdf?1441668038. 14 Adam Morton, ‘Turnbull government accused of blocking US, Japan plan to reduce coal http://www.theage.com.au/environment/un-climate-conference/turnbull-government-accused-of-blocking-us-japan-plan-to-reduce-coal-20151110-gkv02w.html#ixzz3ru8EXTjI. 16 There are, of course, statements from individuals. For example, Anita Talberg from the Australian German Climate and Energy College at University of Melbourne: Australia has one of the highest emissions rate per head of population (as can be seen on the graph below). This means that Australia has produced a lot of historical emissions to get rich.” See further, Australia’s post-2020 climate target not enough to stop 2C warming: experts https://theconversation.com/australias-post-2020-climate-target-not-enough-to-stop-2c-warming-experts-45879. 19James Chessell, ‘Lots of heat expected but climate talks must balance equally conflicting needs’ http://www.afr.com/business/mining/coal/lots-of-heat-expected-but-climate-talks-must-balance-equally-conflicting-needs-20151102-gkpawr#ixzz3ruK6NxS8. 22 Charlottie Wood and Matthew Rimmer, ‘Think global, act local: the role for councils in climate change’ http://www.crikey.com.au/2014/01/30/think-global-act-local-the-role-for-councils-in-climate-change/. 23 Clover Moore, ‘Mayor Clover Moore: Why Sydney’s sustainable future is bright’ CNN, 6 September, http://www.edition.cnn.com/2013/09/06/world/asia/mayor-clover-moore-sydney/. 24 Oliver Milman, ‘Adelaide joins race to become world’s first carbon neutral city’ http://www.theguardian.com/australia-news/2015/sep/09/adelaide-joins-race-to-become-worlds-first-carbon-neutral-city. 25 Explainer: how does today’s Direct Action reverse auction work? https://theconversation.com/explainer-how-does-todays-direct-action-reverse-auction-work-40152. 26 Emission Reduction Fund: Government purchases 47 million tonnes of carbon abatement in first auction http://www.abc.net.au/news/2015-04-23/government-buys-47m-tonnes-of-carbon-abatement-in-erf-auction/6415532. 27 Peter Christoff, ‘On these numbers, Australia’s emissions auction won’t get the job done’ https://theconversation.com/on-these-numbers-australias-emissions-auction-wont-get-the-job-done-40761. 29 See Peter Burdon, ‘Australia’s $200 million climate pledge falls short of its true debt’ https://theconversation.com/australias-200-million-climate-pledge-falls-short-of-its-true-debt-35318 and Jonathan Pickering, ‘UN Green Climate Fund: it’s time for Australia to step up’ https://theconversation.com/un-green-climate-fund-its-time-for-australia-to-step-up-34308. 30 Climate change: Julie Bishop announces Australia’s $200 million contribution to UN Green Climate Fund http://www.abc.net.au/news/2014-12-10/bishop-200-million-to-green-climate-fund-at-un-climate-summit/5956676.